Biology The great “natural” hoax — Is “natural” really better? I hear it all the time. X is better than Y because it’s natural. It’s not full of chemicals. It’s herbal. It’s not artificial. You know what else is natural? Cancer. Bacteria. The polio virus. Tsunamis. Mass extinctions. Malaria. Poisons. Natural disasters. How come we give so much faith to nature, when in fact nature does not like us at all? Nature is not nice. Out there in the wilderness only the fittest survive. Are we watching the same documentaries? The ones where the weak gazelle gets eaten by the lion, the ones where animals die of thirst, illness, starvation. The ones where the scavengers are just waiting for you to die so they can eat your rotting carcass. Human ingenuity is what allows us to observe and understand the laws of nature and then subvert them. Human organisation, the creation of civilisations and technologies that make us live longer, safer and in a fairer environment are all not “natural”. The word “natural” is often used by groups with a moral agenda. For example, it’s used to claim that people of different sexual orientation are “un-natural”. Much like the word normal, natural tends to be a loaded term with positive connotations. But should it, really? What does natural mean anyway? The definition of natural is the first cause for concern. If one defines nature as the “laws that govern the physical world”, then anything we do as humans is “natural”, because, well, we are part of the universe. Our actions are a result of “nature” making us this way. Then the way we live today is almost completely an artificial construct. If we define as nature everything that is not created or affected by humans, then you reading this article on the internet is inherently un-natural. Let’s use the second definition of nature. That which is untouched by humans. Are the things that are “natural” under this definition really better? You might have heard of botulinum toxin, which is a substance produced by some bacteria. Botulinum toxin is, per our definition, 100% natural. Yet it is one of the most poisonous substances known to man. It’s ridiculously poisonous. Nanograms of the stuff are deadly. There are plenty of things found in nature that are good for you. There are plenty of synthetic substances that are good for you. There are also plenty of natural things that are terrible for you and plenty of artificial stuff which is also pretty bad. This means that whether something is natural or not is completely useless information for evaluating its harms or benefits. We should judge all things on a case by case basis, independently of where they come from. It also follows that it’s not possible to use nature as the basis of moral judgement. Natural things are not necessarily morally good. Morality is a human construct: nature does not have any inherent morals. Death, disease, mass extinctions. They just are. You can’t assign arbitrary morality to them. Take two molecules of water. Each formed by the bonds of two hydrogen atoms to one oxygen atom. H2O. One of these molecules was taken from the ocean and one was created in a lab. Now let’s shuffle them around so you don’t know which is which. Is it possible to determine the provenance of each molecule? Nope. Because molecules of the same substance are identical. Molecules don’t store information about where they’ve been. If a herbal remedy contains the same substance as a synthetic medicine then this substance is identical in both. Many of these “natural” remedies are sold as better for you because they come straight from the plant. No human modification. But, sometimes, human modification is useful. Plants are made of a large number of chemicals. A herbal remedy made from a plant may contain lots of the substance you want, but it will also contain many other potentially harmful chemicals. 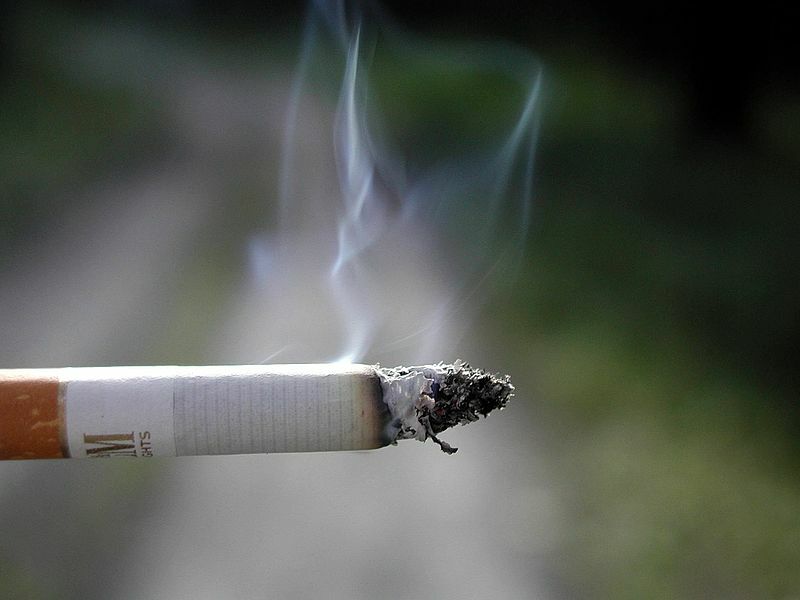 For example, the carcinogens in tobacco smoke include chemicals that are present in the tobacco leaf. As much as some tobacco companies would have you believe that their cigarettes are better because their tobacco is “all-natural”, they still contain all the chemicals that the tobacco plant has produced. (One could, however, argue that wrapping ground tobacco in paper and lighting it on fire is “unnatural”). Aspirin is a medicine derived from salicylic acid (which is found in the bark of the willow tree). The salicylic acid is esterified into aspirine, which makes it less acid and also a more potent medicine. In this case, human modification is very useful. We take a naturally found, very useful, chemical and make it safer and better. In this case, the artificial compound is much better than the natural one. Surgery, pacemakers, hip replacements, cochlear implants, etc. are all artificial medical advances that allow many of our kind to live longer and better than it would be possible in nature. Also, what’s with the people who don’t want fluoride in their water because it’s a “chemical”? Everything is a chemical. Water is a chemical. The air that we breathe is a mix of Nitrogen, Oxygen, Argon and other gases which are all chemicals. Every single substance in the whole universe is a chemical, by definition. There is a perfectly valid reason why we add fluoride to potable water (this process is called water fluoridation): to prevent tooth decay. There is substantial evidence that supports its use in decreasing the incidence of cavities. We must also remember that there are already many minerals and other substances present in drinking water. In some parts of the world, like India, natural levels of fluoride in water are higher than those usually used in fluoridation. Countries that once added fluoride to their water supply and don’t anymore, like Germany, have found different ways to cope with this problem. In Germany, 60-70% of table salt sold contains added fluoride. Toothpaste also contains fluoride. And it works! One of the biggest issues I have with the “all-natural” people is that they pursue their convictions only as far as it’s convenient. No fluoride in my water, easy. “Organic” food, expensive but not hard to find. Rarely anyone goes really “all-natural” and forgoes shelter, clothes and cultivated crops to live the nomadic hunter-gatherer lifestyle of our ancestors. If we take a look at what is normally considered “natural” food we can instantly see some issues. 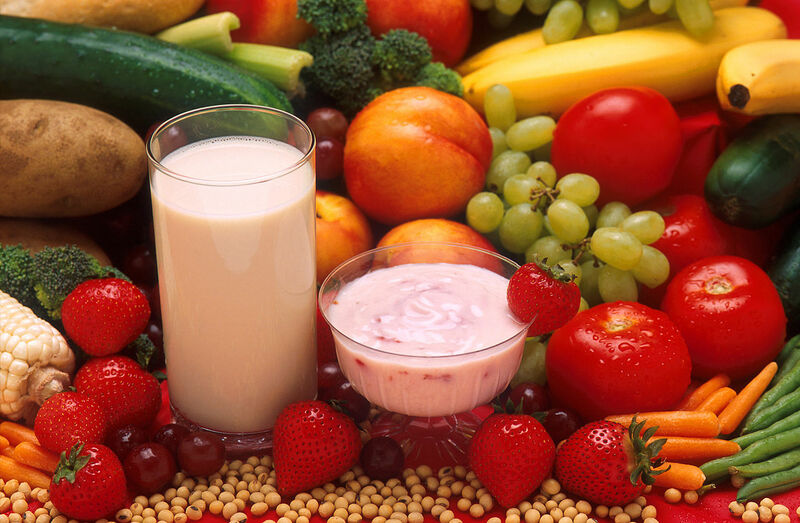 Fresh produce, like apples, bananas, cauliflowers and so on, are all crops. Humans invented farming. Selecting, planting and growing food are examples of humans bending nature to their will. 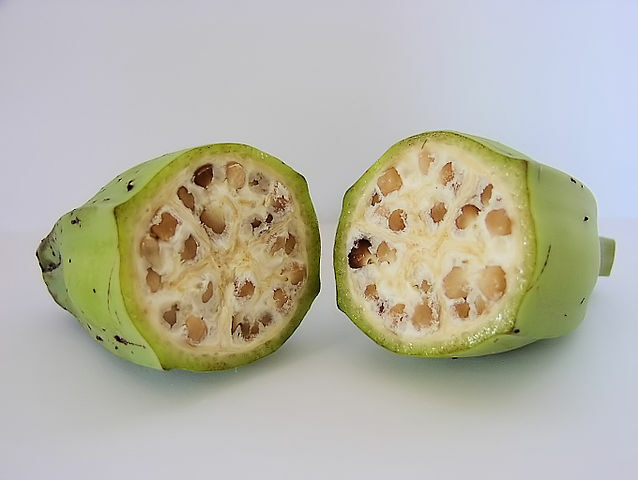 Not only that, in the fourteen thousand years or so since humans have invented farming, we have been busy genetically modifying crops to suit our needs. Wheat, for example, is just a grass that has been selectively bred to produce more and larger grains. This is true of most of the plants we eat. Types of apples are all genetical clones, for example. Every single Gala apple has been produced by trees that are all clones of a single apple tree. If you were to take the seeds of a variety of apple and plant them you’d get very different fruit. To avoid this every single Gala apple tree has been grafted from another Gala apple tree. All Cavendish bananas (the most common variant) are also clones. Bananas have been selectively bred to maximise the flesh inside. A wild, uncultivated, banana looks like the picture below. Full of big hard seeds. If you eat a banana, you’re eating a genetically modified clone. Corn has also been selectively bred and transformed from the small number of shelled kernels in teosinte (corn’s plant ancestor) into the large number of exposed kernels we have today. 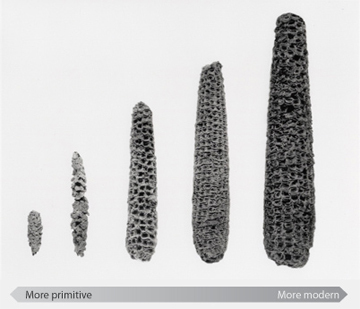 The picture below shows the evolution by artificial selection of corn over several thousand years. The domestication of animals and plants by artificial selection is, according to our second definition, not natural. Humans have been subverting natural selection for their own needs for a really long time. Pets like dogs and cats have been selectively bred too. Cats and dogs living at home is not the “natural” state of things. If you have a domesticated pet you’re definitely behaving un-naturally. If you really wished to live your life as “one with nature”, living in a way that eschews any human creation, you’d have to live like a caveman. You wouldn’t be able to eat the vast majority of food we eat today, you wouldn’t be able to wear clothes or have access to modern medicine. We should evaluate things on a case by case basis using scientific evidence, and not emotional reaction. Blanketing things we don’t like or understand as artificial and hence, morally wrong, is counterproductive. “Natural” does not have a clear definition. But even if we assume that we can in fact categorise things as “natural” and “not natural” there is no way to assign a moral value to either. The value of something is independent of its “natural” status. So next time someone tries to sell you a “natural” remedy make sure you do some research first. Baggini, Julian (2004) – Making sense: philosophy behind the headlines. Oxford University Press – ISBN 978-0-19-280506-5. Special thanks to Federica, Salman and Nikolas for proofreading this essay and providing constructive criticism. This article completely dismisses the other argument and reinforces everything that it’s so-called ‘opponents’ would regard as falsities and misinformation. I wouldn’t consider it farther than I could throw it.nAnd the people who regard the ‘natural’ to be better do not consider cancer an altogether natural occurence but rather as a by-product of the movement away from nature to more artificial alternatives. Like the use of aspertame as a sweetener instead of sugar. Or the addition of fluoride into public drinking water as a method of whitening teeth and ‘preventing tooth decay’. You know where else fluoride was intentionally used? Fluoride was put in large quantities into the water of concentration camps in Nazi Germany(comparatively close to the water in our tap water in the US today) to sterilize the inhabitants. Fluoride can also be used as a method of domesticating animals. They don’t want fluoride in the water for the same reason the writer of this article shouldn’t: it is a neurotoxin. Always has been. And the amount of fluoride in the water is just as toxic as the amount of fluoride in toothpaste and mouthwash. http://www.thelancet.com/journals/laneur/article/PIIS1474-4422(13)70278-3/abstract You are right in saying it won’t kill you, but it does kill parts of the brain.